Being able to grow your own food means that you have COMPLETE control over what you are putting into you and your family’s bodies. You get to pick the seeds, the soil and the water that is being used to grow your fruits and veggies. That means completely organic, GMO free, fresh food could be right at your fingertips! The majority of the produce in your local grocery store has travelled for a long time to get from where it was harvested to your grocery store and then eventually, your kitchen table. Did you know that fresh fruits and vegetables lose many of their nutrients during this travelling process? Not to mention all of the resources that it takes for this food to actually travel to you. To be able to grow even some of your own fresh fruits and vegetables ensures that you are getting quality, wholesome, nutrient rich food, and you are doing your part for the environment as well. 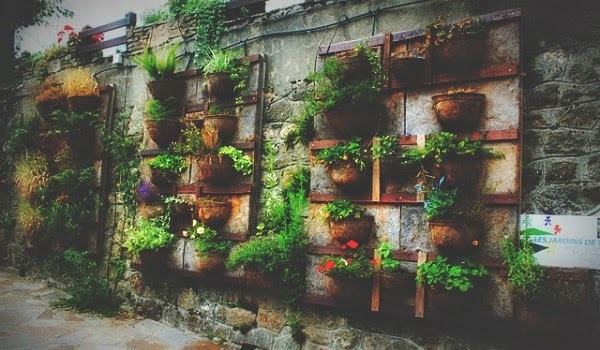 Now imagine if everyone adopted some of these simple gardening practices, how amazing would that be? This not only brings us one step closer to becoming self-sufficient, but it also will majorly cut down all of the emissions from the big trucks and planes that are transporting this produce. So here are 5 simple gardening projects for people who don’t have a garden! Great news, if you have windows, you can grow things! Certain varieties of tomatoes can be grown very well indoors and even in the winter, simply plant in a hanging basket and hang in front of a window that gets a lot of sunlight. You can also start a mini a herb garden by your window or by planting herbs in small containers. You can also attach mason jars to pieces of plywood and fasten them to the wall to start growing the herbs in the jars, just make sure that this wall gets enough sunlight. A pallet can be a great tool to use to grow herbs and even lettuce on your balcony during the warmer months, and a great way to recycle old pallets as well. They are relatively easy to find and can sit neatly against the wall on your balcony or patio. For instructions on how to make a pallet garden, click here. Shoe organizers that are often used in closets can also be a great tool for vertical gardening and growing plants as well. There are many different types of veggies that can be grown in a container on a balcony, porch, or even on a small patch of grass if you are renting a property and are not allowed to put in a garden. (Like me!) Some of these veggies include: broccoli, carrots, cucumbers, eggplants, tomatoes, spinach, squash, peppers, and so on. To learn about proper planting techniques and which size containers to use for each type of vegetable, click here. Windowsills and balcony railings can be excellent places to put planter boxes, they take up none of the limited floor space and receive maximum sunlight. These can also act as a shade for vegetables that require less sunlight for growing, perfect! If none of these ideas are feasible for you, or you just want to do more, but don’t have the space, you should consider finding a local community garden or perhaps sharing a friend or neighbours garden. Many communities have community garden plots that allow you to grow whatever you like in a space that is provided for you. This can be a great way to garden because each member can grow specific vegetables and then trade with each other at harvest time. This can come in handy when certain veggies and herbs are ready, but others are not yet ready to be harvested. All this and you get to meet local like-minded people at the same time.